SPECIFIC Senior Large & Giant Breed is a nutritionally complete and balanced dry food for mature dogs over 25kg. What is SPECIFIC Canine Everyday Senior Large & Giant Breed dry food? 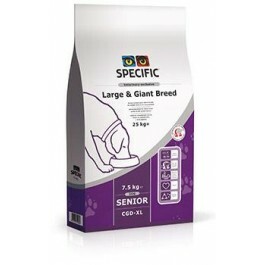 SPECIFIC Senior Large & Giant Breed is a complete and balanced dry food for mature dogs over 25kg. It can be fed as a main meal or mixed with dry kibble. The recipe is rich in Omega-3 from fish help to support healthy skin, coat and joints. The added beta-glucans from yeast help support the immune system. This diet contains lower calories and higher fibre, making it less energy dense. This means that dogs can be fed their usual amount, not leaving them feeling hungry, whilst still controlling weight. With added L-carnitine to help maintain ideal bodyweight. The larger kibble size encourages chewing. The diet is made from highly digestible ingredients and contains added prebiotics (FOS) to promote good digestive health. The reduced protein, Phosphorus and Sodium levels help to lower the workload on the kidneys and added Taurine helps support the heart muscle function. SPECIFIC have added psyllium husk to help firm up stools and regulate the digestive tract. Who is this food suitable for? This food is suitable for senior dogs over 25kg. When is my dogs considered senior? Small breeds (under 10kg): From 8 years. Medium breeds (10 - 25kg): From 7 years. Large breeds (25 - 45kg): From 6 years. Giant breeds (over 45kg): From 5 years. What are the benefits of using SPECIFIC Canine Everyday Senior Large & Giant Breed dry food? What is in SPECIFIC Canine Everyday Senior Large & Giant Breed dry food? EC approved additives: BHA, BHT, propyl gallate. Crude Protein 18.5g, Crude Fat 7.4g, Carbohydrate 57.7g, Crude Fibre 2.8g, Calcium 0.57g, Phosphorus 0.48g, Sodium 0.2g, Taurine 0.11g, L-carnitine 30mg, Omega-3 0.76g, EPA 0.18g, DHA 0.25g, Water 8.5g, Ratio n-3:n-6 1:2. How much SPECIFIC Canine Everyday Senior LArge & Giant Breed dry food should I feed? The daily requirement may vary depending on factors such as breed, environment, season and activity level. It is recommended that you monitor your dog and adjust the feeding amount to fit their individual needs. 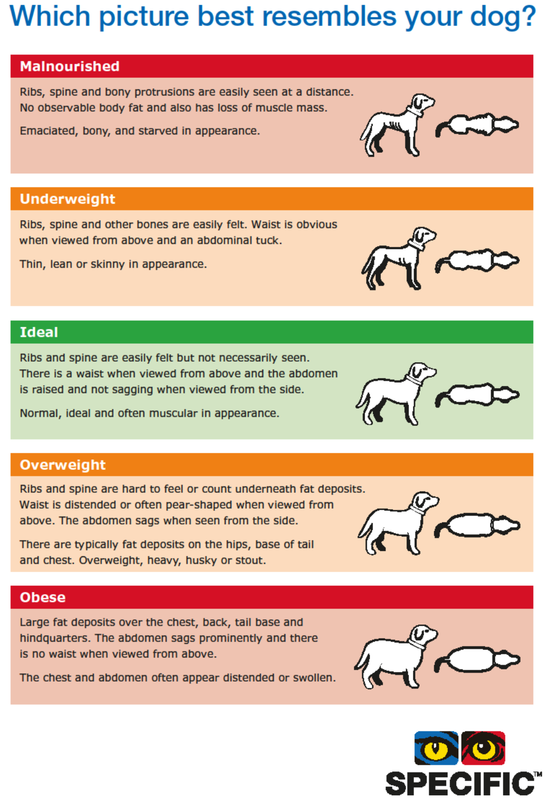 How do I know if my dog is the right weight? Weight check: Get your dog's body condition checked and weighed. Planning: Work with your vet to decide what is the target weight. Choose a suitable food for your dog's needs, and then calculate the daily feeding amount. Implement the feeding: It’s important that you measure out the food so, if you need to you can easily and accurately adjust it. 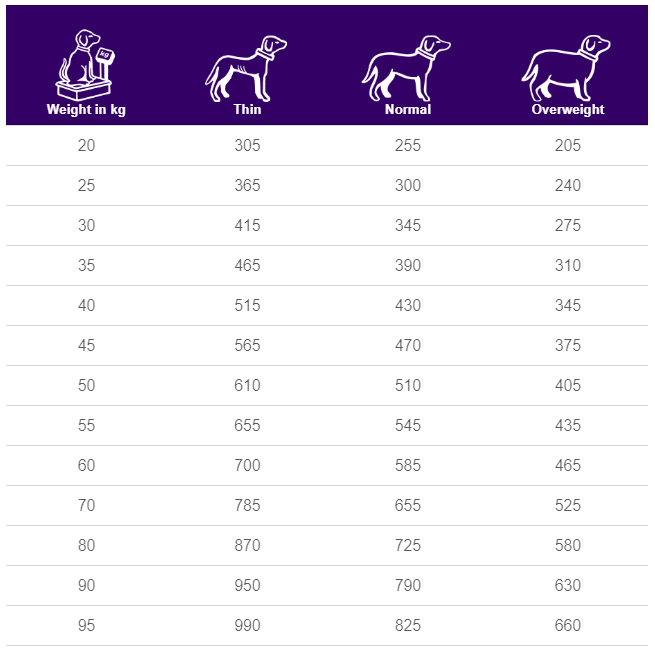 Regularly weigh your dog: A simple way to do this is weigh yourself, then weigh yourself while holding your dog then subtract the two numbers. If you have a larger breed or are unable to carry the dog, it is advised to get your dog to sit on some bathroom scales, or pop into your vets to use the scales in the waiting room! Be patient – It’s not going to happen overnight but if you stick with it your dog will reach their target weight, and it will all be worth it with a happier healthy dog. Maintain weight: Once you have reached target weight you need to make sure they stay there by choosing a suitable food for your dog's needs. Remember: If your dog is on a diet, be careful not to spoil the good work with treats (especially table scraps), and make sure everyone knows what you are doing!